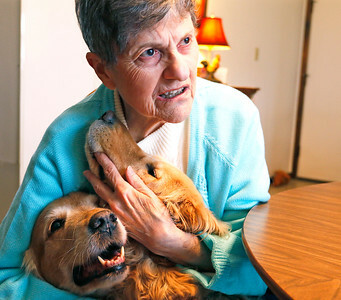 H. Rick Bamman - hbamman@shawmedia.com Legally blind woman Adria Hanus and her service Golden Retriever Cassie are recovering after being attacked by a pit bull during a walk in late March. Police cited the owner of the pit bull, a 65-year-old man who lives in the same neighborhood. 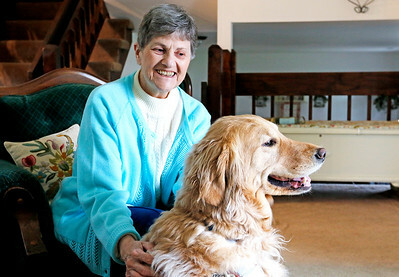 H. Rick Bamman - hbamman@shawmedia.com Legally blind woman Adria Hanus snuggles her service Golden Retrievers Cassie (right) and Honey-B (cq) in their McHenry home on Friday, April 8, 2016. Hanus and Cassie are recovering after being attacked by a pit bull during a walk in late March. Police cited the owner of the pit bull, a 65-year-old man who lives in the same neighborhood. Honey-B is retired from service. 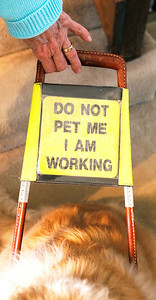 H. Rick Bamman - hbamman@shawmedia.com A sign attached to golden retriever Cassie's harness alerts people that the service dog is assisting legally blind Adria Hanus. Cassie and Hanus are recovering after being attacked by a pit bull during a walk in late March. Police cited the owner of the pit bull, a 65-year-old man who lives in the same neighborhood. H. Rick Bamman - hbamman@shawmedia.com Adria Hanus shows Cassie's wound after the pair were attacked by a pit bull during a walk in late March. Police cited the owner of the pit bull, a 65-year-old man who lives in the same neighborhood. H. Rick Bamman - hbamman@shawmedia.com Ed Hanus huddles with serverce dogs Cassie and Honey-B in their McHenry home. Adria Hanus and Cassie are recovering after being attacked by a pit bull during a walk in late March. Police cited the owner of the pit bull, a 65-year-old man who lives in the same neighborhood. 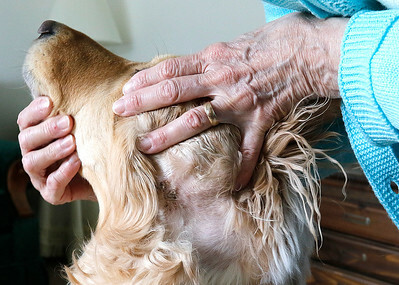 Legally blind woman Adria Hanus and her service Golden Retriever Cassie are recovering after being attacked by a pit bull during a walk in late March. Police cited the owner of the pit bull, a 65-year-old man who lives in the same neighborhood.